Marx was a big fan of cap-and-trade. > Marx was a big fan of cap-and-trade. Stalin was, too. Only for him, it was more along the lines of "Put a cap in him, and trade his goods for something we actually want". I think, in the end, this is Obama's underlying intention, too. Stalin was, too. Only for him, it was more along the lines of â€œPut a cap in him, and trade his goods for something we actually wantâ€. I think, in the end, this is Obamaâ€™s underlying intention, too. Agree with all of that - especially the last sentence. But, to be FAIR TO STALIN....you can also say that about Lenin. I have no idea what rewritten, bastardized history people have been reading, but Lenin was absolutely no less brutal than Stalin. Lenin not only approved of Stalin - especially his brutality - but Lenin chose Stalin as his successor. I believe it's popular to believe that Stalin stole the throne in the shuffle after Lenin's death. Both the American left and the Russian government would like to sell people that fiction because they can then conveniently write Stalin off as an abomination, not as the natural progression of their diseased ideas. The only difference between Lenin and Stalin is that Stalin lived to carry out the plans of Lenin and Lenin died. Just look through the archives of history at the orders Lenin signed. 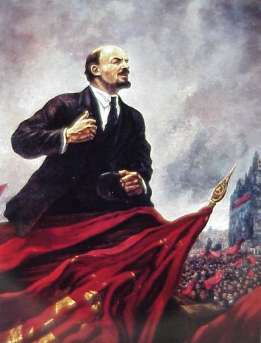 Read "The Collected Works of Lenin". All of those archives are open now. Yet, the truth about bloodthirsty Lenin's murderous brutality has yet to reach the mainstream. Happy freaking Lenin's birthday...I mean...earth day...of course...ahem.